1. Preheat oven and oven tray to 230ºC (210ºC fan forced) for 10 minutes. 2. Spread your McCain SuperFries in a single layer on the preheated oven tray and place in the top half of the oven. 3. Bake in oven for 10 minutes, turn and continue heating for a further 5 minutes until they’re lovely, crisp and light golden. Regular turning is unnecessary. 4. Cook bacon until crispy in frypan, drain on paper towel, and chop. 5. When fries are crispy, remove from oven, season with salt and pepper. Pile fries into the center of the pan. Top with shredded cheese and bacon. 6. Put back in oven for another 3-5 minutes to melt cheese. 7. Remove and top with spring onions. Serve with Ranch dressing or sour cream on the side. 1 Preheat oven and oven tray to 230ºC (210ºC fan forced) for 10 minutes. 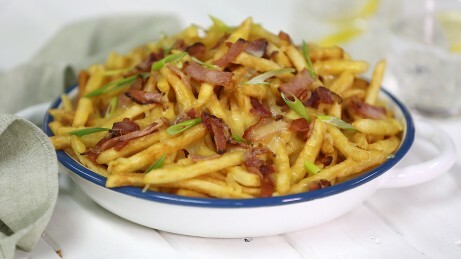 2 Spread your McCain SuperFries in a single layer on the preheated oven tray and place in the top half of the oven. 3 Bake in oven for 10 minutes, turn and continue heating for a further 5 minutes until they’re lovely, crisp and light golden. Regular turning is unnecessary. 4 Cook bacon until crispy in frypan, drain on paper towel, and chop. 5 When fries are crispy, remove from oven, season with salt and pepper. Pile fries into the center of the pan. Top with shredded cheese and bacon. 6 Put back in oven for another 3-5 minutes to melt cheese. 7 Remove and top with spring onions. Serve with Ranch dressing or sour cream on the side.